"It points out where you have to sign"
"Before you had to print and sign, now there's DocuSign"
This is a wonderful alternative to the paper documents. You can remotely sigh a document. Paperless! The idea is fantastic. One document can be sing by 2 or more people. All of them will receive the final signed document. It has happened a few times where I saved my digital signature but for some reason, I couldn't access it. This required me to recreate my signature and resave. Overall, worth it to have a way for customers to sign and avoid the frustration of running them down. Generally, people will be close to their email. This is pretty nice for signing official documents digitally. It makes life a lot easier not to have to go in and sign physically. Docusign is so much better than the old way of printing, mailing or faxing documents with signatures, and far more secure. The best part about Docusign is being able to securely sign a document and send them back to the sender without having to print anything. Also have a digital record is great. "A clean way to sign documents"
Painless way to sign documents without printing them out or eternally googling for solutions. I think it's great how they clearly highlight what needs to be clicked on and the options to add a generic signature-version of your name or draw your actual signature. I especially appreciate not having to ask people to create an account if I send a document through DocuSign. They apparently just get an email with a link and then go through the signing steps as you would with an account. Very handy. The UI still looks kind of clunky and their videos sound like their lawyer wrote the script. A neater interface and a friendly brand voice could help them along with younger audiences. Lastly, as a typical Millennial I lean towards companies that have some sort of compromise for social good. Signing documents electronically clearly helps the environment save on printed paper, and I appreciate DocuSign's website highlighting this fact and even providing an "impact calculator." We are able to send/receive contracts with employees/vendors very easily It makes signing documents and transferring it between people extremely easy and seamless. It is an amazing tool, it is very useful to sign invoices and legal documents from the comfort and virtual everything, simplifying a process that used to be very tedious as it was the use of fax, in addition they can be signed massively, thus simplifying the office work. I also like that it is super simple to use and can be used from any device that we want, besides that for employees it will not be a problem to get used to it. It is super safe and also has excellent technical support that responds instantly and not only that but has a large community that can support its usefulness. It has no negative features, in my opinion it is for companies that are medium or large since the number of documents to sign is greater and it is usually a somewhat tedious job, instead it is automated quite well, the rest has nothing negative is the best option in this section. My recommendation is that they make use of the trial period to know if it is really going to be useful and also take into account that its usefulness is often seen for companies that tend to be large in number of quotes and bills and movements, since it is there where its usefulness is involved. The benefits I have had with it have been great, the truth is the organization of everything that has been reviewed and signed and what is not yet incredible, I think it is a potential tool that is constantly growing, it is very useful as I already said in medium-sized companies where you must sign many documents invoices, among other things. "Very good to save time in document signatures"
As the human resources staff at my company, I am required to get a lot of paperwork signed. DocuSign makes this process extremely easy. They communicate with me when someone views the packets I send for signing, and when it's fully signed. This takes a lot of work away from me in terms of tracking. The only thing I could even slightly complain about is the fact that it takes me a while to set signing fields for multiple people. This is such a minor complaint that I barely feel it's worth mentioning. Docusign serves to make the work more efficient and to use the time better in other things before it was much more difficult to be able to obtain the signatures of the respective documents and that translated in an unnecessary loss of time. Docusign has been great in helping my company deliver good service. In days past we would have to make people come into our office or needlessly print out page after page just to scan the papers into our system to store digitally. Docusign has helped us reduce our carbon footprint while cutting costs on paper goods. "Docusign, Excellent to save time getting fast signatures"
The signature invites expire at midnight which can be challenging to accomodate for some customers. If you have Google Chrome, it in their webstore and its also found on major app platforms as well. I have found that its a great alternative if you don't send contracts or forms that often, this is the way to go. The interface is not difficult to learn and saves your documents in the cloud. The pricing is pretty good for small businesses and personal on par with Adobe. I have used docu sign for writing projects, sending architectural drafts, contracts and clients contracts since I was in school and have moved on to the business level. I can use it on my desktop, phone and ipad. I can keep a paper trail with clients which is the number one reason I use it. I never send a document without it. "Muy buena plataforma para firmar documentos electronicos"
Es fácil de usar para firmar, aprobar y enviar todos sus documentos y acuerdos a todos sus clientes, empleados y partes interesadas. Puedes firmar y aprobar documentos incluso desde un dispositivo móvil y por lo tanto brinda comodidad todo el tiempo. La rapidez en la aprobación de documentos puede llevar al fraude y la pérdida de recursos de la empresa, donde los empleados deshonestos pueden usarlo para aprobar documentos fraudulentos. DocuSign es un software indispensable debido a su facilidad de uso y la forma en que cambia, la forma en que firma y aprueba sus documentos. Los cargos por usar el software no son tan costosos y esto lo hace asequible incluso para organizaciones pequeñas, medianas y grandes. Anteriormente, firmar y aprobar un documento o contrato o incluso un documento simple, como una factura o un albarán de entrega, tomaba un tiempo para que algunos de los documentos pasaran incluso un mes antes de que se enviaran a toda la oficina requerida, se confirmaran y luego se aprobaran. Pero con DocuSign, todo ese largo proceso se ha simplificado y minimizado al enviar una copia del documento a todas las partes interesadas de una vez y en cuestión de horas o un día, todo ha sido aprobado, incluso los documentos complejos. "The modern and easy way to sign"
I save a lot of time and frustration by using this tool. Now that it is engrained as part of my workflow, I can focus on other pressing matters, knowing DocuSign is running circles for me. The amount of karma I've earned from all of the forests I've saved by using DocuSign is worth the small monthly fee alone. In some areas, it's not very user-friendly for the administrator/document initiator. Tech support is also not as helpful as it could be or as responsive. In truth, I've found most of my solutions by using a broad web search. In general, I am too happy with Docusign, it has made my tasks much easier every day, I recommend trying it out and I'm sure they do not go back to the old way. I've saved myself the frustration of chasing down signatures, or worse yet, forgetting to chase them down. The tool provides the signor to sign right there on the spot with the hassles of printing, signing, then scanning. And if I forget to follow up, Docusign automatically sends reminds (that I customize) to the recipient - so it chases them for me! "Very good application to sign documents digitally." Well, DocuSign does what it has to do, the application is designed for a specific task, which is to create stamps or digital signatures, for different types of documents, apart from this, it has different types of editing tools that have the most of text processors that are normally used, which is an ideal complement, to create documents, that represent a brand, and give a touch of additional quality. Should have additional functions that make it easier to edit some documents to avoid having to use external programs, since in some cases, it has some difficulty with the compatibility of some type of document, which has a different type of extension than what We use normally at work. The digitally signed documents always give a better appearance to our customers, and with DocuSign, this is done as quickly as possible, creating all kinds of digital signatures, in a simple way, but improving the quality of the documents that are sent by email or through different virtual media. "Keep Changing their Terms and Not Flexible With Businesses Trying to Scale Up or Down"
Not having to print/scan every new lease and lease renewal anymore. After having been both a Business Pro and Corporate client for over a year I feel like I have enough experience to leave a genuine review. Though there has been some frustration all along with new account managers not familiar with our initial agreement (of course a company like Docusign will have lots of turnover, but maybe they could have a better CRM note-taking routine for keeping future AMs informed on the accounts). But that's not really my main issue. The biggest disappointment was experienced when we told them that we're going to transition over to a new CRM platform that has Docusign already integrated and we will pay for it through that agreement as opposed to directly dealing with Docusign. When I told our AM, and I asked if we could switch over to a pay-per-usage or month-to-month agreement (which for the record is an option for the Business Pro accounts, but apparently not for the Corporate accounts??) he said they can only do 12-month agreements. Ok, we're talking software subscriptions here, of course you can do month-to-month, so it seems pretty silly that they won't do that for a client that is going to still be a client, although indirectly instead of directly. I also asked if they could bulk download all our documents from the last 6 months in a zip file, as Docusign only allows you to download documents 1 at-a-time, which I find to be surprising and frustrating that they still haven't developed a "Bulk-download" feature. I would probably recommend anyone considering Docusign to look into HelloSign as they're much easier to use and much much cheaper. We're switching to that now as a solution until we're fully on-boarded on our new CRM that has Docusign built in. If I could choose to have HelloSign as the built in solution instead I would, from purely a user experience perspective. If you're doing large volumes and need to download and signed documents, it's a real hassle. No bulk download option, and if you're a business that either growing or scaling down there's very little flexibility and options available to you as far as various plans go. We're using Docusign to sign new leases and lease renewals. We have saved time compared to printing and scanning all the documents. "Docusign, Fast and effective signatures"
You can add documents for signatures in bulk mode and that could become very cumbersome if the program does not work well and is wrong when there are many documents to sign, but so far I have not had any problems. It is not conducive to slip sheeting. For example, if we pre-emptively send out signature pages to later slip sheet, the DocuSign PDF does not allow you to actually do so. It helps a lot with the times to manage documents in which a signature is necessary, it is very simple and the main effective. DocuSign has really trimmed down the amount of time we spend on sending out signature packages and getting deals closed. Knowing that we can trim the signing time to literally seconds has really taken a weight off my shoulders and it's great that every client has familiarity. The thing I like best about docusign is that it eliminates the time and the use of paper between contracts / offical documents which require a signature. In the company I work in it makes signing seamless in terms of getting employees across the UK updated without wasting time. As we have 11 offices it makes the process of transportation of documents and printing so much more efficient. We are solving many business problems with docusSign including the ability to sign contracts / legal documents / employee contracts seamlessly without the need to travel or transport documents. It saves error, time and manual printing of documents across business to business sales. It also assists in the process of filing contracts and agreements as they can be stored electronically rather than having piles of paper which can be easily misplaced in a busy work environment. It has solved many business problems for Pinnacle as now we can process more efficiently and effectively for our customers and employees. The software is simple to use however if there are any difficulties there is a wealth of information available on the DocuSign website which offers easy instructions on the usage of all areas of the programme. With just a few clicks I can send our contract off the customers and prospects to review and sign, going through the process to then be countersigned, and the completed item fowarded to all parties. The only issue that sometimes arises with docusign is that it sometimes seems to 'forget' pre-set templates, which means it does not auto populate with the signers as necessary, however this can usually be rectified by reducing the recongnition percentage accordingly. This is an easy to use piece of software that saves a lot of time and resource. A great deal of time and resource is saved thanks to this programme. Previously we had to email contracts to the customer/prospect for them to print, sign and scan back to us. We then had to print and fax the document to our MD (based offsite) which he then scanned back to us, with the final copy going to the customer after being saved in soft copy on our systems. We had to do a fair amount of chasing to follow this process through to completion, however the Docusign software now does all of this for us. "The one software I use for signing digital documents "
Docusign is very simple to use that just about anyone can get going with it with no difficulty whatsoever. From set up to the UI, everything looks well thought out and intuitive. It's also great that I don't have to download documents that I need to sign. This also reduces the amount of paper we have to deal with. The mobile apps are really great and ensure that the software can be use anywhere there's an internet connection. It'll be really difficult finding faults with this software. Everything works as intended. Only thing is that it's a bit pricier than some of its competitors. Docusign makes it incredibly easy to sign documents digitally;documents that normally would have required that we download, sign and figure out a way to send back. With Docusign, that whole process is made so simple. And it's faster, thus boosting productivity and efficiency. DocuSign is the ultimate solution for signing electronic documents without having to print them. It is really simple to use and so that anyone person can make their electronic signature does not need to create an account through this tool. From my point of view, this tool does not have negative characteristics. For companies of any size this tool turns out to be very useful. It is advisable to use the trial period of this tool to determine if it will be really useful for you and if it fits the needs you require. The benefit of being able to sign any electronic document before having to print them is something that we have been looking for for a long time and it has made our work much easier thanks to DocuSign. "The best software to sign documents digitally"
This is one of the most helpful softwares I use at work. With Docusign, I don´t have to spend money printing documents and sending them to customers to sign. It is easy to load a document, point where you need the customer to sign or fill a field, and send it with no problem. The customer only needs to receive it and sign it digitally, with no need to have a Docusign account. To be honest, is difficult to dislike something, because even the customer support was superb. It is a very intuitive and easy to use software. I am solving several business problems. I was spending a lot of money on original documents and waiting for customers to print them, sign them and then scan them. With Docusign everything is very easy, and I am saving the world and saving a lot of money without using any paper. "Docusign is very useful to sign documents in batch." DocuSign makes it easy to track and collect needed signatures on official documents. It sends out individual signing reminders for each party involved and then consolidates all the digital signatures onto one document. It has a slight learning curve (as does most software at first). But once you figure out where every setting is it is very intuitive. Very satisfied with the product and use it frequently. It makes all document handling a breeze. This really is the best software idea in a long time. It makes all document handling a breeze. Makes getting signatures digitally extremely easy and fast. It's super easy to use and is extremely reliable. Very convenient when I need someone to sign contracts online, especially if this person is in another state. "Does what it promises, but there are many other options out there." Simple, works on all platforms. Easy for layman to implement and get documents signed without hassle. Helpful for paperless systems to maintain compliance with signature requirements on financial documents, consent forms, contracts and the like. Simple implementation, did not require technical expertise to set up. I especially like how easy it is for customers to get into the platform and sign something, it seems anybody can accomplish this regardless of their computer system be it mobile, desktop, or tablet. The cost is higher than many of its competitors, I believe this is just due to the name recognition. For performing such a basic task such as signing a document there are less costly options available within many ERP or CRM platforms. Definately do it if your current systems don't already have a digital signature system in place. Not a bad add-on for traditional paper systems. Easy to use for everyone involved, no technical experience required. Saving paper and speeding admissions process for new clients. Allows us to get important financial and consent forms signed and filed without forcing people to print/fax/scan paper just to get a signature. Has completely eliminated our need for pen and paper during new client admissions. Brand recognition is a main draw for DocuSign customers that I've worked with. It's a brand that people tend to trust. Second to that I highly value the tight integration between DocuSign, Drawloop and Salesforce. This combination has allowed me to setup some really great automation processes for documents requiring signature. Some of our customers have had challenges with navigating the signing experience. Some will think they've completed the signing process when they have not, and that causes frustration or delays. DocuSign does allow some customization to the signing experience, but unfortunately that customization is global for your system. You have to use the same signing experience across all of your documents. The biggest benefit is the reduced time to complete the signing process. The automated routing capabilities of DocuSign have enabled us to significantly reduce turnaround and cost over a traditional paper process where documents must be physically mailed out, or wait in queues to be signed by different parties. "Docusign Quick signatures when you need it"
DocuSign is an excellent tool for obtaining signatures and formalizing documents without the need to print, fill, scan and email documents. It's a great time saver and provides a seamless way to submit documents with signatures in a few simple steps. There are few drawbacks to the software and nothing worth noting here. Perhaps it's a little manual in that you have to tailor your document to be used in DocuSign, but nothing particularly difficult. Overall I would highly recommend DocuSign and use it for anything that needs a signature. Its time stamp feature and central storage repository makes document management fantastic and avoids the need to file documents manually. Most people have used DocuSign at one point or another, so it's quite familiar to most users. "Easy to use and very good app for keeping signature records at one place"
This is the best app to keep your important signed documents at one place. we have been using this app from the start and it helped ua to keep our all important records at one place. Need a little Guidance to understand the use Once understood you can easily maintain all your documentation. This is the perfect app to store all you signed records at one place. We have we using the same since the start of our company and we are so sure that this is the best app we are using for signing our paper works. The home page helps you to keep a eye on unsigned records which need your attentation. I would suggest this small app for the company need documentation and need the signatures at one place. App is easy to use once we learn how to use. And need only few steps to complete all the documentation signed. Its really help us to maintain our records of Contractors and all singed documents that are legal and that need to keep records as per the USCIS rules. It really help us to keep our records at one place. "DocuSign is the ultimate esignature tool"
Device independent. Works like a charm over all mobile devices like Phone, iPad, Tablets and of course Browsers. New Sign Experience makes it more responsive and fast - like Liquid. Reporting module provides accurate statistics of DocuSign Usage. Reports can be scheduled to be delivered. Administration is extremely easy and very effective. User addition as well as Leavers process is crisp. Better support for highly customized forms. They sometimes break on some browsers. Better testing of products before releasing to customers. Reporting can be improved with more information regarding documents. Reporting permission management can be improved. Integration with third party softwares and services can be improved. DocuSign Connect should support more environments. DocuSign is very good for e signatures. Saves money time and effort in getting documents signed. Saves the environment by reducing carbon footprint. DocuSign supports the environment by reducing carbon foot print and improving the environment. Reduction in paper based and ink based signature saves trees. Reduction in paper based and ink based signature saves time taken to move the documents from one signer to next. Reduces time taken to complete Signing process. Workflow mechanism ensures documents are moved along the proper path. The best feature of the tool is the vast integration that it has with Salesforce. This allows our users to use SSO and login to DocuSign directly from Salesforce to view their envelopes. The reporting interface could use some work. It's a bit cumbersome and doesn't have the flexibility that it should. Would love to be able to slice and dice reports based on fields that I can choose. This is definitely one the best digital signature tools out there on the market. We use DocuSign for Salesforce and have it integrated into our reps quoting process. It solves the issue of paper contracts and signature delays due to them. Our orders are completed about 50% faster if the reps uses DocuSign instead of a "paper" quote. I would like to have more admin controls and more functionality for the more creative, "outside of the box" things that we are using DocuSign for. Take one of the DocuSign certification classes! Our phone representatives are now able to do their own loan signings remotely, without forcing people to come in to the branch to sign.We're finally catching up to the rest of the world! We are also using Powerforms to replace paper and old electronic forms for internal use, which is giving us better information and accuracy because employees can't just re-send an old version of the form. They just click the link and go! *** Following up: I now work for another financial institution and they also use it for document storage as well. "Makes signing easy with few glitches"
It's very simple and straightforward to design a form with fields that are easy to customize. Simple workflow options are also easy to manage. The admin side of things is also fairly simple. The user interface is actually really aesthetically pleasing. Because of the nice, clean, easy interface, it was a tool that I was able to train others on in a short amount of time. There are some glitches that are hard to figure out, and the help desk area is a little convoluted and not as easily and streamlined as the rest of the product. Moving from the classic experience to the new experience was difficult, and we bought the project right during the transition. There were some things that were offered on one side of things, but not on the other. There was also an issue of signing up for a trial version, and then signing up for a full account, and somehow two accounts were created with two sign-in email addresses, and we'd have to get them merged. It was confusing. It really is effective at helping manage and streamline the signing of documents, and I don't think there's a better product out there for this. We have so many documents that require signatures. DocuSign seriously reduced the need for inter-office paper mail, reducing labor costs and errors. At first, I was very skeptic (still kinda am). It seemed very sketchy. I mean, it's not really my signature, so I was skeptic as to how this can be legit. Perhaps they can find a way to assure their customers the legal possible stuff. I don't have much problems in terms of using it. I guess my only problem is the legitimacy of adopting a signature. Like, what if I encounter some legal complication; will this make a problem? But for the benefits: really saved me a lot of time and made my life easy! We use this software to have our clients sign the papwerwork needed for us to be able to help them repair their credit. It is very easy to use. I love the fact that it comes with a ton of different templates that you can edit so that they better fit what you need them for. To be honest I really have not found anything about this software that I don't like. We switched over from dispute suite and the signing process and the voice process was extremely difficulty but with docusign I have had no issues to this point. If you need a software that allows your clients to be able to sign things online on their own time in an easy fashion this is the software you want to use. This software allows us to be able to send a contract to our clients using an established templete and let them sign it while they are on the phone with us. If they are not able to sign at the time they are on the phone they can esign later and we still receive the information that they have signed as soon as they do it. "Easy to use - intuitive - secure"
Docusign is very easy to use and incredibly intuitive. I have experienced that it is secure, and fulfills my needs as well as the needs of my clients. I can send them Docusign documents and expect that they will intuitively understand how to e-sign it without printing out, without instruction, and without any issues. This makes it very nice for me, as it helps with my own brand in streamlining their operations and processes. It takes a way a lot of the cumbersome nature of printing out and signing multiple pages. It also does a very nice job with user interface and user experience, as it highlights the areas that still need to be signed and also jumps automatically to the next place. If a signature line hasn't been filled out appropriately, it will bring you back to that section in order to complete it, which is very helpful. I need signatures for my consulting business on contracts. 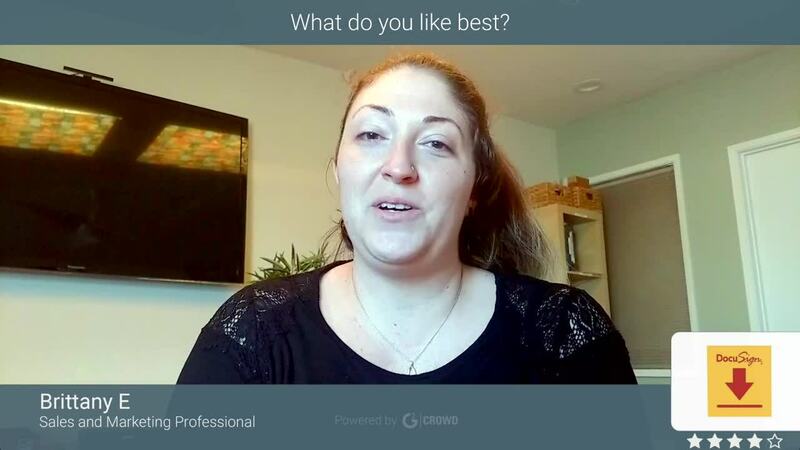 It makes it super easy for my clients, who are often solo entrepreneurs. "Most flexible way of getting the document signed"
With both parties doing the e-sign is the best part which saves lot of link in the printer and very importantly time.I use the mobile app a lot and it's pretty good and user friendly. Nothing much to dislike. I would say the month-to month subscription is little expensive for some businesses. DocuSign is really useful getting work done fast and also saves lot of money with paper and ink. I have seen difference is time it takes for manual sing and by using DocuSign and the results are excellent. We used to have very long process of getting the documents singed which require the vendor to print, sign, scan and email the documents. Some time this reduces the quality of the document too. With docusign, we have the paper work done pretty fast with best quality. "The smart way to sign documents"
Is easy to sign any docs, send it signed, fill out fillable PDFs, send to sign docs to my clients. If you need to fill a PDF, you have quite limited tools. Nothing to say, I think it's the smart way to sign documents, there's no comparison to doing it the old way. DocuSign was used by my employers and by me the most of the time because it was on market early and is working in conjunction with my old emails boxed. It's quick to work, it's adjusting my documents as needed automatically, give a choice of fonts, you can send docs, or it sends it to the sender with no problems. "The best to accelerate the signature process"
Very helpful for setting up contract e-documents that require signature and DocuSign has been the preferred software in our firm! Highly recommended for any company's recruiting department! The setup of documents may require some learning at the beginning. But, once you are comfortable with this software, then your hiring processes move quick! Totally recommended for a small and medium company, it speeds up the process of signing important documents and papers. The convenience of being able to edit the document to have it say what we need it to say so that the client completely understands the process they will go through and how much it is going to cost them. At times it can a little confusing for the client to be able to figure out where exactly they have to sign have had a few clients that had trouble finding all of the spots where they had to initial and sign. Make sure when you go over something with the person you want to sign the forms you send them through docusign that you stay on the phone with them and instruct them on exactly how many boxes and spots there are for them to sign at. Docu Sign allows us to be able to have the client completely sign all forms necessary for us to get them started in our program before we hangup the phone. All details of what we are to be doing for them is clearly laid out in the docusign form we use. DocuSign allows us to get documents out for signature quickly and efficiently without a ton of work. The best part is, we don't have to nag people to get them back to us. The lack of native document generation for us is a bit of a downside which requires us to contract another software to get that part done. If we could generate documents from within DocuSign, it would be ideal. If you're looking for dynamic document generation, you'll have to look elsewhere for now. Our contracts (both for clients and new hires) are sent out through DocuSign, ensuring that we have full visibility of the process and cut down paper waste. 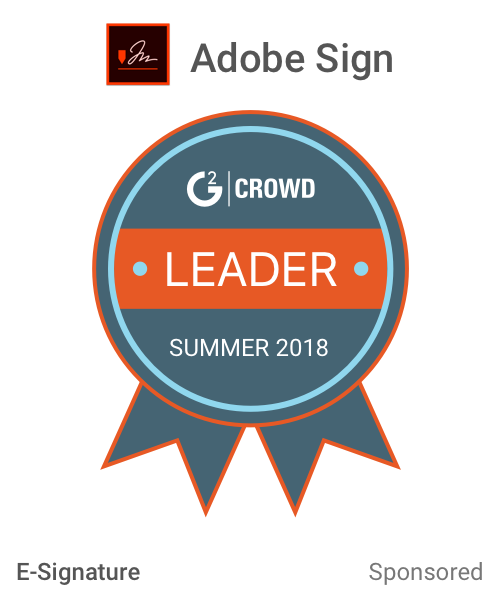 "One of the best eSignature Products"
2) Creating e-signature workflow to route the same document across multiple parties to capture their signatures on the same document. 3) Ability to create custom emails and sign-in page templates using XML. 1) Ability for the user to change 'red' highlighting on the required fields on the Powerform. 2) Powerform builder is not fully ADA Section 502 compatible for visually impaired folks. Using DocuSign we were able to convert 4 business processes where end users were exchanging emails, faxes, mails, phone calls to exchange information with our agency. With the use of DocuSign our users are now able to fill out online applications pertaining to their Business; sign it and route it to our admin via DocuSign. "DocuSign - The Safest and easiest way for electronic signature"
In DocuSign uploading a document for signature or retrieve it is fairly a simple process It allows to enter the name and email address of each person who need to electronically sign then use drag and drop to specify which fields need to be filled in by signers. We are using Docusign for our Sales team where all the legal and sales contracts are getting electronically signed using DocuSign. DocuSign should allow a customized platform to integrate it with other web application. I would love to see if Docusign can provide a platform through which we can access the information via API / Webservice calls. Easy to use, Cloud storage, Legally Safe and secure, Secure authentication method,100% availability without any issues. DocuSign is the best feature we have for our Sales team for procuring the digitally signed sales contracts and legal documents via secure process. At docuSign all the electronic signatures are legal and safe to use for signing important/confidential documents. Docusign has a great integration with Salesforce that allows for documents to be sent automatically with tags already in place with the click of a couple buttons. Click and drag functionality is easy to use and it’s easy to create custom fields. The mobile app is fantastic as well and makes for easy on the go signature. I do not like the fact that you cannot delete or void an agreement without a notification being sent out to the original recipient. I would like there to be a way to either send a notification that the document was deleted/voided or to just delete with no email. If there are different versions of a document that have been sent and I want to go back through and clean things up, it causes confusion if a contract has already been signed. Docusign allows me to easily get agreements signed by two parties with minimal back and forth. It allows people to access documents on the go for signatures even out of the office with no computer access. I Love that all of our contracts are now completely digital. I wasn't thrilled with learning how to use it. We had a couple issues in the beginning. Take the time to learn how everything works and feel free to talk to customer support to get your questions answered up front. It will save you from headaches along the way. DocuSign has sped up the sales process from usually over a week to same or next day. It has also increased sales, in a way. In the past, we would send out contracts in the mail. Then the potential customer would have to sign and mail back the contracts. since this took days for them to receive the contracts, we would occasionally lose a sale. Each sales was thousands of dollars. Now, because of docusign, I can fill in our template contracts and have the customer sign them while i'm on the phone or at least within a short period of time. I no longer lose sales that I thought were solid. My customers also are quite impressed by the advanced technology that digital signitures bring to the table. As far as employee's, all the employee's that would have any need to use this service, have been trained and have become proficient with it, including a 62 year old computer illiterate gentleman that was sure he would never be able to use it. I give this product two thumbs up!!! "Great way to make agreements when people located remotely"
The customization options it provides to add edit fields like text fields, name, signatures, check boxes, dates and many more. The one thing it like the best is you can upload customized documents for agreements, add any number of people within an agreement.And the advance options of like setting the validity of the agreement and correction options are a plus. Once a document is created and signed by the owner, it does not allow the owner of the go back and make edits to the documents. If any mistakes happen in the document in such scenarios leave owner no option but to void the existing document and create a new one. Great Product for online agreement. I am using DocuSign for processing the affiliation agreements between an academic institution and the internship organizations which provides internship to students of our institution. The major benefit is that it has become hassel-free process to come up with agreements with organizations which are globally located otherwise, we had to mail the agreements and get them signed manually and get them mailed back to us. "Great product for electronic document signing!" I like that I can create my documents with any program I want, however I want, and upload it into DocuSign. From there I can add all of the places I want filled in by the user or auto-filled by the system. I had a little trouble with the expiration dates on the forms (a glitch in the system) and had to re-create a few of them, however, this is a quick and easy processes. This is definitely the way to go. You can send documents electronically as well as handle them in person. If you already have them in your computer, all you have to do is upload them and easily add the boxes to fill in. There are many ways to customize them as well. If you have multiple versions of the same document, all you have to do is create a copy of the template and replace the document. This expedites the program we offer. We used to mail the documents to our potential clients and wait for them to be mailed back. This saves us and the clients so much time. It allows helps us get all of the information we need since there is a "required field" feature that doesn't allow them to finish the document if they don't fill them all in. It can be clunky to get the right template in lace, and sometime the field are slightly askew after I apply to template to a new document. It is a minor in convenience. Also I had a problem with Docusigns landing in spam, but it had something to do with our email servers needing to be formatted for Docusign. Talk to your It guy about it is apparently easy to fix. Make sure you talk to your IT guy about setting up the email server to send Docusign, I am not familiar with thte technical side of it, and it is apparently an easy fix, but many of our Docusign were landing in spam for a time. Make it easier for people to buy. It has become so integral to our process and industry that clients expect it now. I highly recommend to anyone who has not adopted this tool yet. I can sit with my client (or conference call) to flesh out the Scope of Work and send via DocuSign for signature. There is no need for printing. It is so simple to use. I can't think of a single thing that I dislike about this product. I would suggest using the trial version to show you "at no cost risk" how easy it is to use. I have not had an instance where any of my clients refused to use it. A majority of the time, they already have / use it. I can send the doc via DocuSign. I can see when they've opened/reviewed it. The fastest turnaround was literally 2 minutes. Its a great tool tool to use to secure your documents that need a signature that you can't get otherwise from someone that's not in front of you to sign. We are able to save our verification electronic signatures after a client has signed off on a form and have a record of it in case we lose a hard copy for it. "Most convenient tool for e-signatures on documents." The e-signing of documents is very easy and convenient using this tool. It offers a rich set of features and functionalities using which we can ask all the concerned individuals to do the signatures electronically on the documents whenever required. It also offers a very good API support using which the complete process can be automated. For someone who is using this tool for the first time it could be a bit challenging, the user interface could be more user friendly. Once a user understands the basic flow, then he/she is good to go and rest everything is fine. This tool is used to perform e-signatures by all the concerned stake holders on the Product Lifecycle (PLC) Documents which are generated after each sprint i.e. every 3 weeks. I being the DevOps Engineer have automated the process of sending the documents for signatures using the API of DocuSign. I love how fast and easy it is to get important things done. Contract negotiations are hard enough without endless papers flying back and forth. I feel good knowing I get online, up to date, easily archivable copies of my important contracts that I can address quickly without having to even get up and scan them. As someone with a busy job, even these small efficiency gains feel like huge wins for me. I can't think of anything about the service that isn't exactly what I need. It's simple and effective to use. In fact, it's so easy I'm struggling to add more meat to this review. The only other recommendation I have is that depending on your status as a government contractor or healthcare provider or other specialized field, you may need to research whether DocuSign meets all your regulatory obligations. But for the world of industrial safety supplies, it's perfect! In eCommerce, I do business with vendors and software providers that can be next door, two states over, or in Europe. DocuSign allows me to quickly and painlessly negotiate deals with people all over the world. I also use it in my personal life for things like college payment contracts. "The modern version to sign documents"
This had made sending and receiving time sensitive documents fast and easy. Security is a fundamental part of this and DocuSign makes me think that I can trust them and their service. At times, the signature doesn't quite transfer properly and it looks aesthetically out of place. Signatures safely and quickly is the best point, in addition, the program is very easy to use from the beginning, no training is necessary. 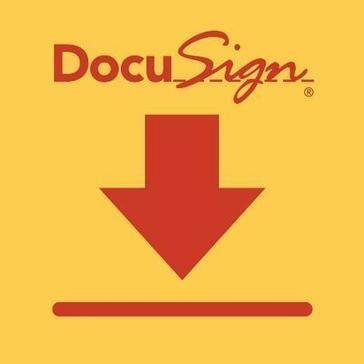 I love DocuSign because it is easy to upload documents. The software is easy to use and I feel that my documents are kept safe and private. This makes it easy to send and share with others. "Great for simple to slightly complex complete and sign documents"
Docusign is great for easily being able to get signatures and paperwork filled out without having to consistently print and re-scan documents. In addition, it saves the documents so that we aren't having to find more room to store the paperwork in the cabinet that just gathers clutter. In addition, we can utilize it with our main company software (Procore Technologies) to store everything in one location. The level we have purchased does not allow us to create rules (or I haven't figured out how to do it), where things can switch between required and not required depending on answers to previous questions. Although I do like the fact that you can hide buttons and text boxes until something is clicked. The biggest frustration is when a box is not required, it usually doesn't get filled out because Docusign only automatically jumps to the required boxes. If you are looking for a product to help create an easy workflow of signatures and eliminate paper in the process, Docusign is simple to use and every time you send a document to someone to fill out and sign, it comes with instructions of how to send it on to someone else or print and re-scan if they are uncomfortable signing documents online. It is user friendly and easy to understand. Reusable templates to minimize having to consistently recreate common items. "Cost and Time Saving Approval Software"
I like best that we can save paper, no longer do we need to print forms to have signed only to scan them in and trash the paper copies. There is a large green savings with DocuSign and we are glad to be able to use it in our company globally. I dislike that we cannot edit previously signed documents, I understand the legality behind it but admins should have more options on how to correct or change documents. Any company that requires signatures should obtain this software. It is easy to use, hassle free and eco friendly. The time savings for our company out weigh the costs dramatically. This software improves visibility for our global teams and increases proficiency and communication. We are globally able to now approve projects, and execute plans in real time vs. waiting for multiple signatures. "Docusign makes it easy to get signatures quickly"
My new favorite part of docusign is the Salesforce integration. It makes it so easy to send out a document without ever having to leave my CRM during the sales process. Hmm. I don't really have any gripes with docusign at this time. It's worked as intended thus far and the interface has been improved over time. The integration with Salesforce is the best thing ever! We're able to get signed contracts so much quicker. Using Docusign allows us to get signatures done electronically instead of sending PDFs that need to be printed, scanned and then emailed back. It really smooths out the customer experience all around. "Extremely easy document signing and sending"
Document limits don't go by the calendar month, so it can be confusing when you are running low. DocuSign is very easy to use and it is actually fun to drag and drop the signature and other fields into documents. I've learned from experience that for some contracts, it's a good idea to send the draft by email if there's a chance that the person wants to change it. Once you send a document, it counts towards your monthly total even if it is not signed. I am never the signer of the contracts, and DocuSign makes it easy for me to track the status, remind people, and get notified when the document is completed by adding myself as a person to get a copy when it is finished. This saves time for everyone and makes it easy for people to sign documents on the road without having to print and scan documents. Sending contracts and other documents to be signed is much easier because you don't have to waste paper by printing them and time in scanning them. They're already digital documents and can just be uploaded, signed online and downloaded after everyone signs. * We monitor all DocuSign reviews to prevent fraudulent reviews and keep review quality high. We do not post reviews by company employees or direct competitors. Validated reviews require the user to submit a screenshot of the product containing their user ID, in order to verify a user is an actual user of the product. Hi there! Are you looking to implement a solution like DocuSign?